It's been an unfulfilling season so far for the Miami Heat, who at 24-27 are in eighth place in the Eastern Conference and will carry a three-game losing streak into Tuesday night's visit to the Moda Center to face the Trail Blazers. There have been high times and gut-wrenching moments for Miami coach Erik Spoelstra, but he has been around long enough to take the time to smell the roses. "Any season I have in this profession, I look at as a blessing," the former Jesuit High and University of Portland point guard said via telephone from Miami. "I love the people I work with. I love our organization and what we stand for. "I really love the guys in the locker room. I want to help them have an experience with this group, something they'll remember years from now. We're a long ways from that, but things can change very quickly in this league. "I know I love coming to work. I love the profession of coaching. It's volatile. It changes year to year. It's extremely invigorating and challenging, but it beats working a normal 9-5 desk job any day. What else would I want to do?" Spoelstra — son of former Blazers executive Jon Spoelstra — is in his 11th season as coach of the Heat, tied for second in seniority (with Dallas' Rick Carlisle) behind only San Antonio's Gregg Popovich in the NBA. Spoelstra has been with the Miami organization for 24 years, beginning as a video coordinator in 1995-96. 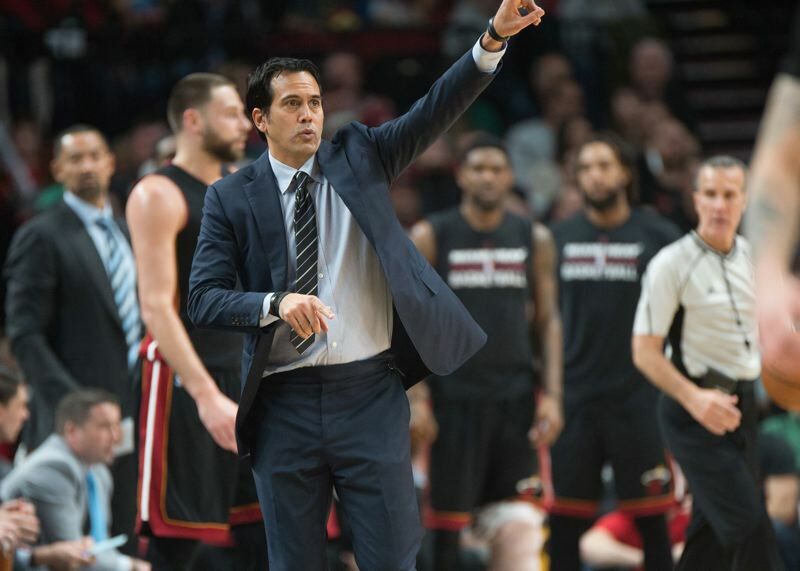 As a head coach, Spoelstra's regular-season record is 508-346, making him one of 32 coaches in the league's 73-year history to reach the 500-win plateau. He had winning records in eight of his first 10 years; his teams, led by LeBron James, made the NBA Finals four straight seasons, winning titles in 2011-12 and 2012-13. "Not every season is going to end like 2012-13, when we won 66 games and 27 in a row, and won a championship in dramatic fashion in a Game 7 (against the Spurs)," Spoelstra said. "That's not reality. There are a lot more seasons like the one we're having this year. I've enjoyed these types of challenges, too." Since the 2013-14 season, the Heat have won only one playoff series, but players on this year's team are being paid like NBA champions. The Heat have a league-high payroll of $158 million, with $135 million in salary committed for next year. The salary cap this season is $101.9 million, with the luxury tax threshold at $123.7 million. Center Hassan Whiteside ($25.4 million), guard Tyler Johnson ($19.25 million) and forward James Johnson ($14.7 million) are being paid a king's ransom, with disappointing results. Owner Micky Arison is not getting his money's worth. "We never look at salary," Spoelstra said. "For our team to fully reach its potential and have the success we planned and hoped for, the parts have to work together. The guys have to bring something more out of each other. We're not built for any singular player to be a dominant guiding force. It truly is the sum is bigger than all the parts." The Heat have been ravaged by injury. The starting guards have been missing most of the season. Goran Dragic has played only 14 games — two since Nov. 16 — and had his knee scoped on Dec. 19. He is expected back after All-Star break. Dion Waiters has played only 13 games after ankle surgery more than a year ago. Reserve forward Derrick Jones injured a knee a week ago and will be out at least six weeks. Guards Dwyane Wade (knee) and Tyler Johnson (calf) and James Johnson (hernia) also have missed significant time. "Every team deals with injuries on some level at some point," Spoelstra said. "We have had an opportunity to be further along than we are at this point. That's been somewhat disappointing. We're not as far as I feel we should be, but our record is what it is." The Heat come to Portland with the sixth-best defensive rating in the league (106.5). "That's been the key for us, no doubt," Spoelstra said. "We've able to lean on that for the most part." Fourth-year shooting guard Josh Richardson leads Miami in scoring at 17.4 points per game but has shot poorly through most of the last three weeks. "Josh has a lot of responsibilities for us — to handle, to score, to facilitate, to defend the top wing player," Spoelstra said. "But with those responsibilities come expectations. After the first six weeks of season, (opponents) started to notice him a little more and in a different way than in years past. Scouting reports have changed on him. So we'll work with him and continue to try to get better." Perhaps the most consistent player on the Heat has been the 37-year-old Wade, who is coming off the bench to score 13.6 points per game and average a team-high 4.3 assists. Spoelstra and Wade — who has said he will retire after this season — go back to 2003-04, when Wade was a rookie and Spoelstra an assistant coach with the Heat. "I had lunch with Dwyane in late summer to get a feel for what he was thinking about, whether he was going to come back (this season) or not," Spoelstra said. "We put it all out on the table on a remarkable afternoon overlooking (Biscayne) Bay, and I'm thankful he chose to come back for another year. "I'm embracing every minute of it. We've been through everything you can go through together in the Association. I'm thankful for that partnership and friendship. I've loved watching him as a competitor, a champion and someone now who has evolved into a totally different level of leadership, mentorship and someday Hall of Fame membership." Erik and his wife of 2 1/2 years, Nikki, became parents for the first time last year. Son Santiago is 10 months old and active. "That's why I'm rushing home now," Spoelstra, 48, said with a laugh. "He is moving around. He's not walking yet, but he is keeping my wife and I alert, that's for sure. "We have really enjoyed it, all of it — the unpredictability, the chaos. We're trying to figure it all out like any other new parents." Spoelstra always keeps extra tabs on the performance of the Blazers, the team he followed growing up. "I really respect what they've done this year," Spoelstra said. "Coach (Terry) Stotts has done a tremendous job with that group. The resilience they've shown to come back this year with the same group after a disappointing playoff (result) last year ... it's not easy. "We've been through seasons like that. Most teams give up on that and start over, and it usually takes years to recover from that. What they did was not feel sorry for themselves, and showed some responsibility. It's been pretty impressive what they've done in a highly competitive Western Conference." Portland is the first stop on a five-game trip for the Heat, who don't play again until Friday. Spoelstra said he made a "head coach/executive decision" to spend most of the time between games in his hometown. "I want the guys to go out and see the beauty of the city of Portland, to try some of the amazing new restaurants and see something else but Nike while we're there," he said.